Magic Realism developed as an art movement in the years after World War I . For many decades thereafter numerous artists throughout Europe and subsequently in the Americas crafted a representational art, mixed with elements of fantasy. This art was often typified by remarkable detail and sharp focus. Yet more importantly Magic Realism taps into emotional reservoirs within all of us. It tricks us by hiding unexpected or suggestive content in what at first might seem to be a common or ordinary scene. This article has been revised to add information and images. Date: January 15, 2011. Magic Realism evolved as a current within the Post-Expressionism movement in Weimar Germany. Related to the Return to Order movement as seen elsewhere in Europe, Post-Expressionism exhibited fewer neoclassical impulses than the parallel postwar realist trends in Italy and France. Post-Expressionism evolved by shedding Expressionism's emotionally charged nature and abstract style. This process moved much slower than the related trends in other European countries, not fully maturing until the mid 1920s. The term Magic Realism was coined by the writer Franz Roh in 1925. He was referring to works within Post-Expressionistic art in which some mystery or a secret seemed to be hidden within the subject matter. This type of art differed from 19th Century Realism, which was generally naturalistic or narrative in nature. Important influences on Magic Realism came from the naive art of Henri Rousseau and the Metaphysical works of Giorgio de Chirico. Magic Realism is a type of realism using contemporary subjects, often in cool detachment and sometimes injecting an eerie atmosphere. Juxtapositions of sharply rendered and detailed elements, both in the foreground and background, are used to develop an air of mystery or ambiguity. Although the paintings may incorporate everyday objects, their objective is not to appear dull or banal . Instead they attempt to show us the everyday world in new and unfamiliar ways. They remind us that there are still many mysteries in life. Magic Realism acted as a portal to Surrealism, and later also influenced Contemporary Realism . Most American artists remained isolated from the developments in Europe in the first three decades of the 20th Century. Generally, the Realism of the 1920s and 30s in the U.S. is referred to as The American Scene. This included rural art, called Regionalism, and urban art, usually referred to as Social Realism . American art had strong traditions of Realism going back to the 18th century, somewhat influenced not only by late developing Impressionism, but also by indigenous Expressionism and by naive styles. Within The American Scene there were many styles, some of which are closely related to the Magic Realism of Germany. Grant Wood traveled to Europe several times, where he studied the German and Flemish Masters and became acquainted with Neue Sachlichkeit. He developed a parochial naturalism with a satirical bend. Ivan Albright developed a bizarre realism with extreme detail, which eventually appeared ossified. During this same time, the Precisionists, led by Charles Sheeler, developed a detached style of art with sharp detail, sharing many characteristics with Neue Sachlichkeit . Two other artists who began painting in the 1940s became important Magic Realists. George Tooker, friend of Paul Cadmus and Jared French, working in egg tempera exclusively, consistently produced work during the next 50 years. And the Canadian Alex Colville perhaps produced a body of work over six decades that most closely fits the concepts of Magic Realism, as originally defined in Germany in the 1920s.Many other artists throughout the U.S., Canada and also in Latin America produced art related to Magic Realism . However, the rise of Abstract Expressionism in the U.S. during this period took most of the publicity away from representational art, at least during the middle portion of the century. Some writers argue that Magic Realism doesn't really encompasses a movement in art, but that it's simply a style. It should be noted that there is controversy about most art movements. It is true that there is no manifesto for Magic Realism, and no recognized standard bearers. These artists did not find the need to be part of the avant-garde nor were they publicity seekers. They acted instead as individuals, who often painted for a small devoted audience. Magic Realism is not Realism per se, but it is fabrications from the artist's perception and imagination masquerading as Reality. Every artist/magician uses different tricks and keeps his own secrets. Still these artists communicate amongst themselves through cool detached observations about each others works. Perhaps we should nickname Magic Realism "The Quiet Movement". 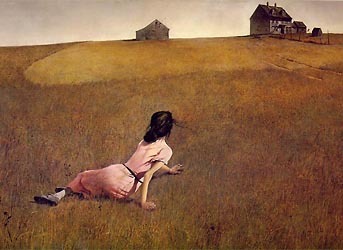 In Andrew Wyeth's Christina's World pictured above, we first see a young girl, who is looking with us at a rural farm in the distance. As we look more closely, we notice that the girl's arms are thin and deformed. We later learn that she is not, in fact, a young woman, but Christina Olson, disabled and in her fifties, as she drags herself through the field toward her house on the skyline. Magic Realism reminds us that we don't always at first understand the true identity of objects, and also that, beyond the surface, there are many phenomena and mysteries in life that are not easily understood.